View More In Security Lock Boxes. With our 4-Digit Combination Key Safe Lock Box you never have to leave work because school was dismissed early for weather, or because your in-laws showed-up on a whim. This durable, wall-mounted key box can be affixed to any solid surface, indoors or out, to make up to 5 keys available to those who you trust with your access code. The steel construction of our Key Box makes it non-corrosive and weather-resistant. It won't freeze and crack or rust. A weatherproof shutter cover slides over the 4 combination dials is to shield them from rain, snow and ice. The hinged access cover stays connected to the box so there is no 2-handed fumbling, and its' flush mount adds impact resistance. No amount of sawing or prying will gain access the key compartment. When you or a loved one needs access, though, the process couldn't be easier. Anyone, young or old, can deftly turn the combination dials. Choose your own pass code, or one that a caretaker or service tech can remember; there are more than 10,000 possibilities, making it even more difficult to guess a combination. You'll want to use your Key Safe right away so we include all mounting hardware. Holes are pre-drilled on the back of the key box for your convenience. 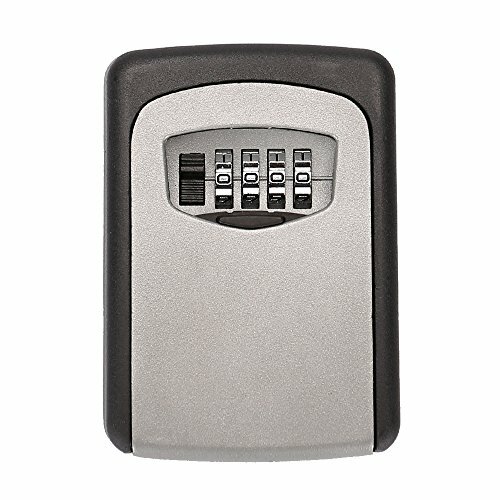 Your Key Safe can be installed on drywall, steel doors, fence posts and more. You can even mount one near the newspaper box. The roomy key compartment has plenty of room for subscription money. You can have security AND convenience when you add the Wall Mount Key Safe Lock Box with 4-Digit Combination to your cart today. LARGE, SECURE STORAGE for up to 5 house keys or car keys. Prevent lock-outs and provide access to your property by health aides, service technicians and pet sitters when you are at work or on vacation. Perfect solution storing keys for AirBnB rentals. If you have any questions about this product by Tekmun, contact us by completing and submitting the form below. If you are looking for a specif part number, please include it with your message.